Forum » SpaceEngine » Gameplay Discussions » Forming Planets, Planetoids and Planetoid collisions? 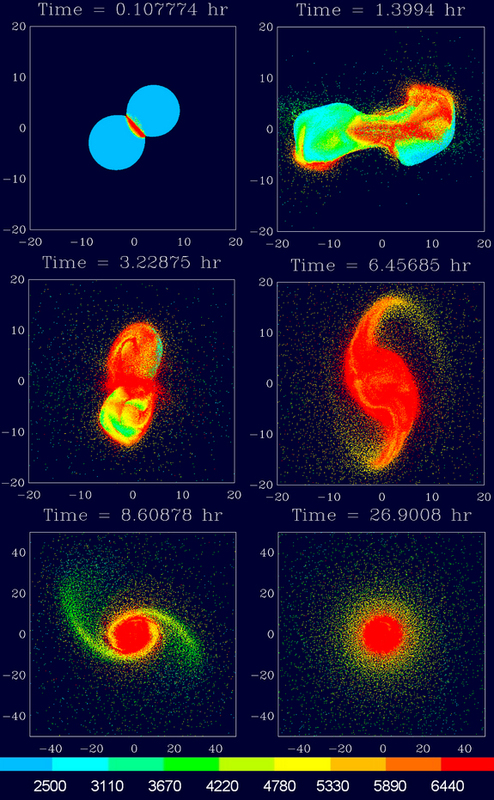 Forming Planets, Planetoids and Planetoid collisions? I think it would be awesome to have the point where you see the birth of a new planet, with all the asteroids surrounded the planetoid, crashes together bit by bit, until the planet is born. And also have the reconstruction of the earth collision with the planetoid on the other planets at birth. We all agree that would be awesome (and it's been suggested many times), but it will be impractical to show it in Space Engine for the foreseeable future. Maybe someday! Please also take a moment to read the Forum Rules Thread. And welcome to the boards! This is extremely hard to implement even on a supercomputers. You may expect only some sort of fake. I've found a video that kind of depicts the collision of proto-Earth and Theia in real time. Neat. The physics isn't realistic, nor are parameters correct for the Moon-forming impact (Theia was much larger, for instance), but it does accurately portray how gradual the process is on a planetary scale. Also, the actual velocities of colliding planetary bodies is closest to what we see in the first segment of the video. Everything after that is too fast, and yet it still seems slow. I've always thought the still frames from astrophysical simulations of the Theia collision are breathtaking. The scale of the destruction is immense, but if you could watch it in person (preferably from a safe distance), it would seem almost peaceful in its progression. It takes several minutes just for the impact energy to be delivered, and minutes more for the ejecta streams to become prominent. The significant parts of the event unfold over many hours. And I think this kind of animations don't inculcate the real dimensions of the catastrophy. Wow I would totally rest with my eyes wide open the whole 7 hours anter the collision.